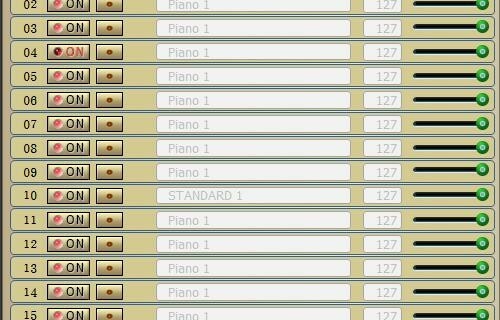 Are you looking for a program that can remove the melody track from a midi file? Or do you want to remove some unwanted track from a midi or kar file? Don’t worry, here you will find a new software able to do this. 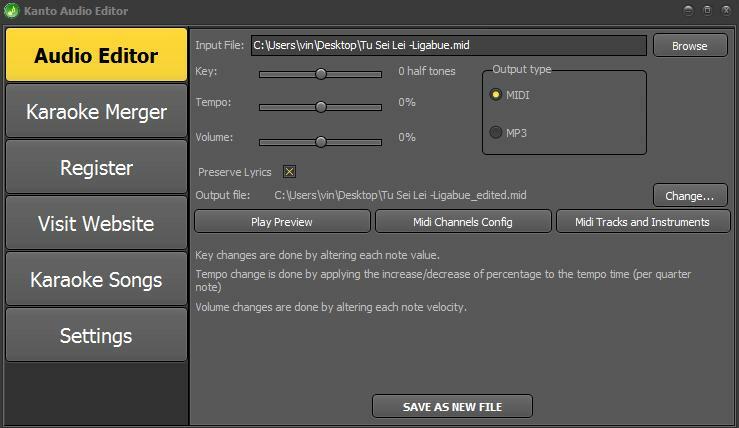 The software’s name is Kanto Audio Editor and it is a midi&mp3 editor that can help you do do different things like change key of a midi song, change key/volume/speed of a mp3 file, convert midi to mp3, etc… Is is also a great tool to remove the melody track in a midi file. 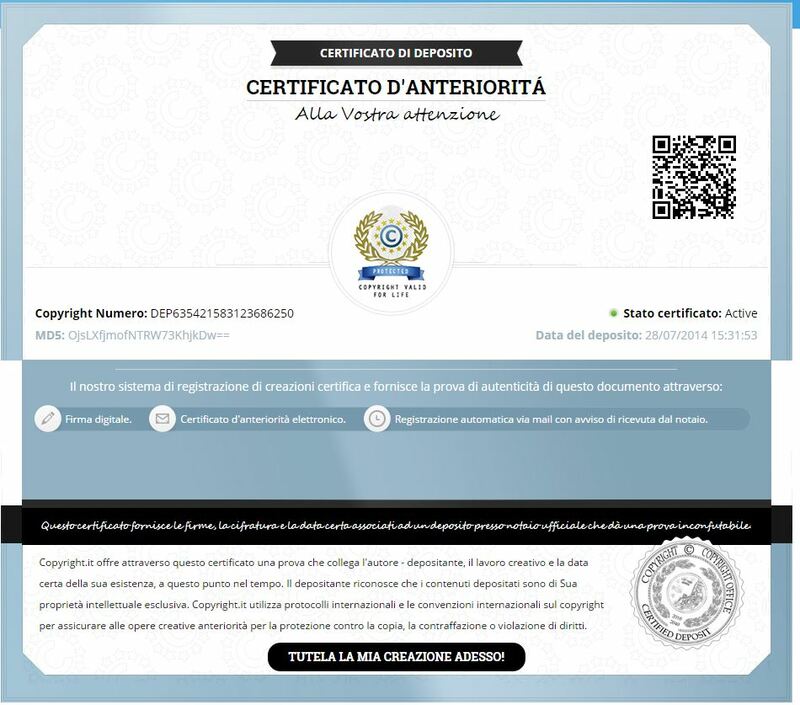 Once downloaded, install it on your PC (supports WIndows 10, Windows 8, Windows 7, Windows Vista and XP). 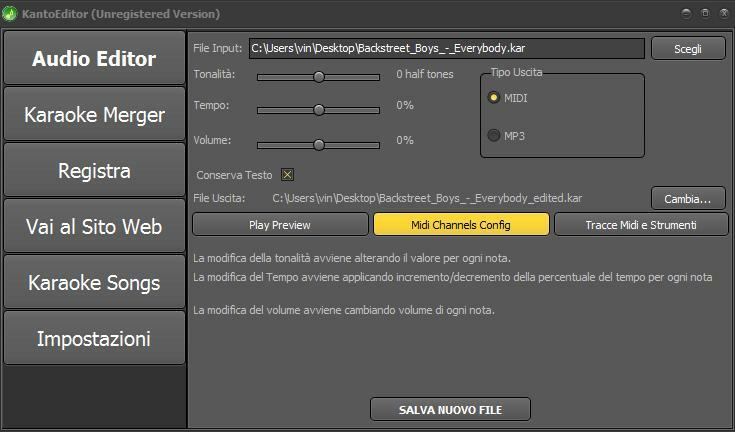 Kanto Audio Editor is very simple to use. Here are the steps to follow to remove the melody track (or any other track) from a midi file. 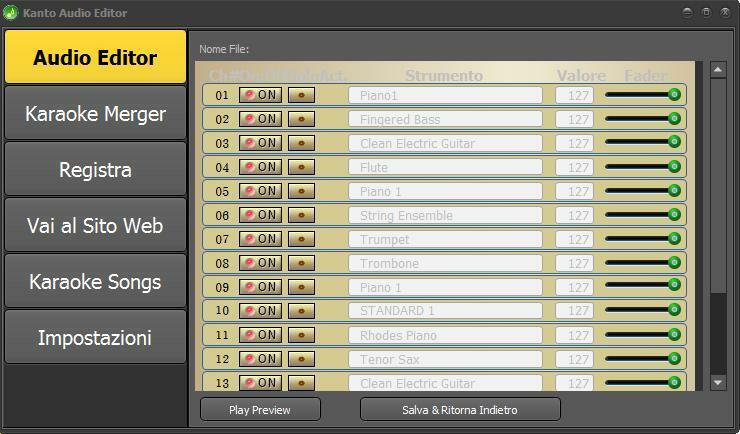 Click on BROWSE to import the midi or kar file that you want edit. After importing the MIDI file, select “MIDI” in the “Output type” section. This will allow you to create a new MIDI file in output. Here you finally can remove the unwanted midi tracks. If you want to remove the melody track you have to uncheck the track number 4: this usually is the track containing the melody of the song. To ensure that you have deleted the correct track, click on PLAY PREVIEW to listen to the song changed. If everything is OK, click on “Save and go back” to return to the main window of the tool. Choose the output folder and finally click on SAVE AS NEW FILE to create the new MIDI file.